Pre-moistened wipes clean and disinfect hard, nonporous surfaces in your home, laboratory vehicle, hotel, school, store or auto. Ideal for equipment, stainless steel, formica, counters, cabinets, sinks, tabletops, telephones, railings and toilet seats. Gentle, water-based formula is safe for plastic, laminate, metal, Plexiglas and rubber yet tough enough to kill tuberculosis, H1N1, bacteria, viruses and staph. Soft, absorbent towels also offer a fresh clean scent and come in a convenient dispenser. 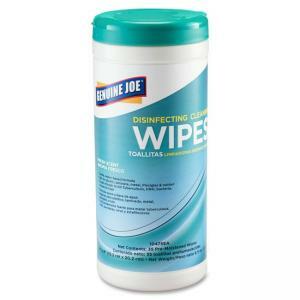 Each 6" x 8" wipe cleans and disinfects in one step.